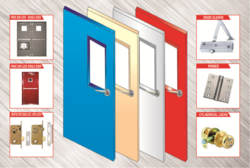 Prominent & Leading Manufacturer from Hyderabad, we offer metal doors and dock door. Constructions : Door frame from 1.2mm to 1.6mm thick pre-galvanised steel sheet mitred and welded corners,frame stretchers, hinge reinforcing plates, fixing plates and hardware mounting plates. Door leaf filled 0.8mm to 1.2mm thick alip coated pre-galvansied steel sheet to ASTM A527/ASTM A525,JIS G 33302 or BS 2989(1994). Zinc coating 80-120g.m2. 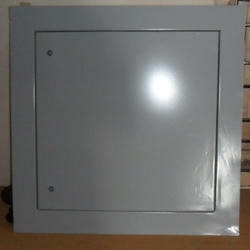 Lock formed panels with internal stiffeners, 3.0mm thick hinge reinforcing, hardware mounting plates and lock protection. Core Material : Door leaf filled with either paper honeycomb/rockwool/Aluminium honeycomb,infill dependent on duty. Finish : Powder coated surface. Fixings : Fixings through frame by expansion bolt Mortat straps. Frame Assembly : Welded construction with frame spreaders. Knock-down frame construction for wrap around frames. Sizes : Up to 3000 mm high and 3000 mm wide subject to test data limitations.